Welcome Grandkids Yard Sign - - personalized lawn mount sign for grandparents to welcome your special grandson and/or granddaughter when they come to your house. Just the thing for every proud Grandma and Grandpa (or Nana, Bubbie, Pop Pop, Zayde, Savta ...). Five piece set consists of one personalized red acrylic welcome plaque; three white 'saying' signs; and a 24" wooden stake. Personalized sign on top holds up to has four lines of personalization. Dimensions: 10"W x 5.75"H. Color: red. Each line holds up to twelve (12) characters. Use the sample signs above and in the second small image for inspiration. If you don't need all four lines for your red sign, please leave the extra input box(es) empty. The 10"W x 1.25"H white signs contain the three sayings you select from the following list. Your complete package contains one personalized top plaque, three saying plaques, a 24" wooden stake with pre-made start holes and stainless screws. 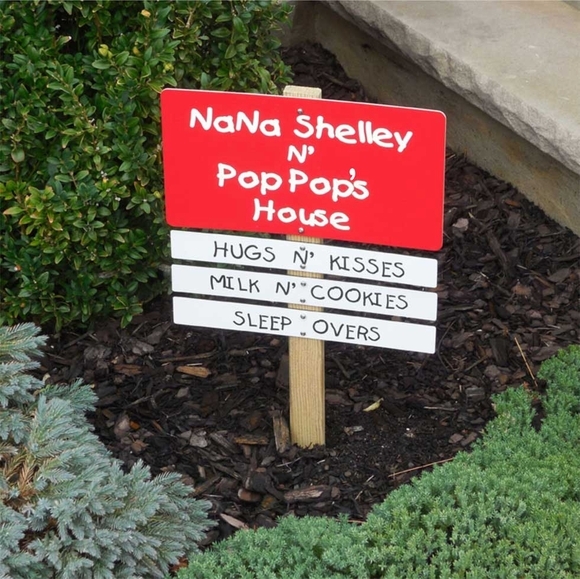 Welcome Grandkids Yard Sign personalized lawn mount sign for grandparents to welcome your special grandchildren when they come to visit.